There's one reason to purchase the Zondervan KJV Study Bible: to understand God's Word and God's heart as well as you possibly can. With over 20,000 notes and an abundance of study tools reflecting the forefront of conservative scholarship, this Bible is a veritable resource library designed to help you grasp the Scriptures like never before. It's packed with theological, archaeological, historical, geographical, cultural, and linguistic information. 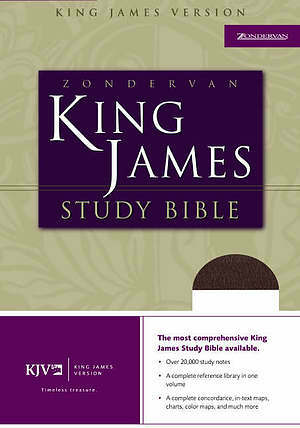 Simply put, it's the ultimate King James study Bible. Compare the Zondervan KJV Study Bible with any other KJV study Bible and you'll quickly see why nothing else even comes close. We've done our utmost to give you a Bible that only increases in its usefulness as you grow in Christ. Read it daily, study it deeply, mark it up, make it your prayer guidebook, search it for wisdom, guidance, and encouragement, and treasure it like a close friend. You'll value it more and more as the years go by. Here are just a few of the features that set the Zondervan KJV Study Bible in a class by itself: *STUDY NOTES-- nearly four times more than in any other comparable KJV study Bible--provide the best conservative scholarship on God's Word. *16 PAGES OF FULL-COLOR MAPS plus timelines and presentation pages. *KJV CONCORDANCE plus other helpful study and reference tools. *INTRODUCTIONS AND OUTLINES provide valuable information for each book of the Bible. *WORDS OF CHRIST IN RED LETTER. *IN-TEXT MAPS, CHARTS, DIAGRAMS, AND ILLUSTRATIONS right where you want them--no need to flip pages. KJV Study Bible: Burgundy, Bonded Leather by Zondervan was published by Zondervan in March 2002 and is our 20711th best seller. The ISBN for KJV Study Bible: Burgundy, Bonded Leather is 9780310918943. Be the first to review KJV Study Bible: Burgundy, Bonded Leather! Got a question? No problem! Just click here to ask us about KJV Study Bible: Burgundy, Bonded Leather. A:This Bible measures 25.4 cm x 17.8 cm. The thickness is 4.3 cm Thank you for using Q&A Forum.